Alvin Products Aluminum High Heat Automotive Engine Spray Paint - 12 oz. Aerosol Spray Can. Alvin Products High Heat Automotive Spray Paint withstands continuous temp's to 1200°F. Alvin Products Aluminum High Heat Automotive Engine Brush or Spray Paint - 1 Quart Can. Alvin Products High Heat Automotive Paint withstands continuous temp's to 1200°F. Alvin Products Andover White High Heat Automotive Engine Spray Paint - 12 oz. Aerosol Spray Can. Alvin Products High Heat Automotive Spray Paint withstands continuous temp's to 1200°F. Alvin Products Andover White High Heat Automotive Engine Brush or Spray Paint - 1 Quart Can. 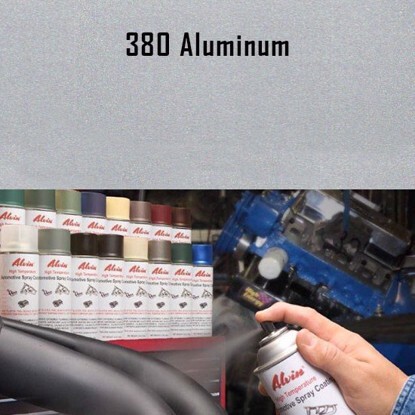 Alvin Products High Heat Automotive Paint withstands continuous temp's to 1200°F. Alvin Products Antique Ruby High Heat Automotive Engine Spray Paint - 12 oz. Aerosol Spray Can. Alvin Products High Heat Automotive Spray Paint withstands continuous temp's to 1200°F. Alvin Products Antique Ruby High Heat Automotive Engine Brush or Spray Paint - 1 Quart Can. Alvin Products High Temperature Automotive Paint withstands continuous temp's to 1200°F. Alvin Products Black High Heat Automotive Engine Spray Paint - 12 oz. Aerosol Spray Can. Alvin Products High Heat Automotive Spray Paint withstands continuous temp's to 1200°F. Alvin Products Black High Heat Automotive Engine Brush or Spray Paint - 1 Quart Can. Alvin Products High Temperature Automotive Paint withstands continuous temp's to 1200°F. Alvin Products Clay Tan High Heat Automotive Engine Spray Paint - 12 oz. Aerosol Spray Can. Alvin Products High Heat Automotive Spray Paint withstands continuous temp's to 1200°F. Alvin Products Clay Tan High Heat Automotive Engine Brush or Spray Paint - 1 Quart Can. Alvin Products High Temperature Automotive Paint withstands continuous temp's to 1200°F. 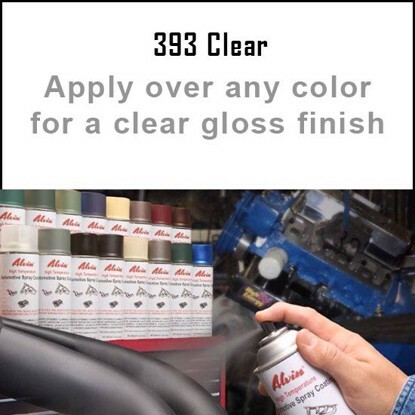 Alvin Products Clear High Heat Automotive Engine Brush or Spray Paint - 1 Quart Can. Alvin Products High Temperature Automotive Paint withstands continuous temp's to 1200°F. Alvin Products Clear Gloss High Heat Automotive Engine Spray Paint - 12 oz. Aerosol Spray Can. A clear gloss high temperature paint which can be used as a clear coating or a topcoat over our other colors to get a glossy finish. Alvin Products High Heat Automotive Spray Paint withstands continuous temp's to 1200°F. Alvin Products Gloucester Gray High Heat Automotive Engine Brush or Spray Paint - 1 Quart Can. Alvin Products High Temperature Automotive Paint withstands continuous temp's to 1200°F. Alvin Products Gold High Heat Automotive Engine Spray Paint - 12 oz. Aerosol Spray Can. Alvin Products High Heat Automotive Spray Paint withstands continuous temp's to 1200°F. Alvin Products Gold High Heat Automotive Engine Brush or Spray Paint - 1 Quart Can. Alvin Products High Temperature Automotive Paint withstands continuous temp's to 1200°F. Alvin Products Hanover Red High Heat Automotive Engine Spray Paint - 12 oz. Aerosol Spray Can. Alvin Products High Heat Automotive Spray Paint withstands continuous temp's to 1200°F. Alvin Products Hanover Red High Heat Automotive Engine Brush or Spray Paint - 1 Quart Can. Alvin Products High Temperature Automotive Paint withstands continuous temp's to 1200°F. Alvin Products Hunter Green High Heat Automotive Engine Spray Paint - 12 oz. Aerosol Spray Can. Alvin Products High Heat Automotive Spray Paint withstands continuous temp's to 1200°F. Alvin Products Hunter Green High Heat Automotive Engine Brush or Spray Paint - 1 Quart Can. Alvin Products High Temperature Automotive Paint withstands continuous temp's to 1200°F. Alvin Products Ivory High Heat Automotive Engine Spray Paint - 12 oz. Aerosol Spray Can. Alvin Products High Heat Automotive Spray Paint withstands continuous temp's to 1200°F. Alvin Products Ivory High Heat Automotive Engine Brush or Spray Paint - 1 Quart Can. Alvin Products High Temperature Automotive Paint withstands continuous temp's to 1200°F. Alvin Products Jade Green High Heat Automotive Engine Spray Paint - 12 oz. Aerosol Spray Can. Alvin Products High Heat Automotive Spray Paint withstands continuous temp's to 1200°F. Alvin Products Jade Green High Heat Automotive Engine Brush or Spray Paint - 1 Quart Can. Alvin Products High Temperature Automotive Paint withstands continuous temp's to 1200°F. Alvin Products Metallic Black High Heat Automotive Engine Spray Paint - 12 oz. Aerosol Spray Can. Alvin Products High Heat Automotive Spray Paint withstands continuous temp's to 1200°F. Alvin Products Metallic Black High Heat Automotive Engine Brush or Spray Paint - 1 Quart Can. Alvin Products High Temperature Automotive Paint withstands continuous temp's to 1200°F. Alvin Products Metallic Blue High Heat Automotive Engine Spray Paint - 12 oz. Aerosol Spray Can. Alvin Products High Heat Automotive Spray Paint withstands continuous temp's to 1200°F. Alvin Products Metallic Blue High Heat Automotive Engine Brush or Spray Paint - 1 Quart Can. Alvin Products High Temperature Automotive Paint withstands continuous temp's to 1200°F. Alvin Products Metallic Brown High Heat Automotive Engine Spray Paint - 12 oz. Aerosol Spray Can. Alvin Products High Heat Automotive Spray Paint withstands continuous temp's to 1200°F. Alvin Products Metallic Brown High Heat Automotive Engine Brush or Spray Paint - 1 Quart Can. Alvin Products High Temperature Automotive Paint withstands continuous temp's to 1200°F. Alvin Products Metallic Charcoal High Heat Automotive Engine Spray Paint - 12 oz. Aerosol Spray Can. Alvin Products High Heat Automotive Spray Paint withstands continuous temp's to 1200°F.